I Am Not A Crock! Recently the Obama Regime’s chief baby-killer, HHS Secretary Kathleen Sebelius stood before the the House Energy and Commerce Subcommittee on Health and brazenly said her boss’ plan to force insurance companies to provide any and all contraceptive and sterilization procedures for free wouldn’t cost them anything. The reduction in the number of pregnancies compensates for the cost of contraception. There has been much and cry as a result of her distracting comment, as would be expected in this soundbite-driven world. Largely this outrage is due to most people either not contextualizing Sebelius’ comment or having been provided the context in the first place. Hence, they’re distracted and outrage because Sebelius’ comment, if applied to the larger milieu, would be heinous and quite disturbingly similar to other recent atrocities. What Sebelius was claiming was that it was OK for the Obama Regime to force health insurance companies to give all approved forms of birth control away for free because doing so was supposedly cheaper for them than paying for the pregnancies. It’s always fun the watch a Liberal faced with real questions.� Never having an actual answer, they fall back on one or more of their cult mantras. Can’t think? Chant. Rep. Brett Guthrie (R-KY), a member of the subcommittee, later summed up the rational response to Sebelius’ statement better than I could. Their argument is this: Health insurance companies will offer it for free because they make money. You reduce the number of people getting pregnant therefore you reduce the cost of pregnancy, or low birth weight pregnancies or other kind of pregnancies. If you think about it, why don�t health insurance companies provide it now if the argument is health insurance companies are going to make a lot of money? If the health insurance companies were really acting in their own best interest, they would be giving these pills out for free, if it really saved money? That about sums it up. If the “oh-so-greedy” insurance companies would make money off of giving contraceptives and sterilizations for free, wouldn’t they already be doing it? Think about it objectively! If the insurance companies are as heartless and greedy as the Leftists portray them to be and giving away contraceptives was a cost benefit wouldn’t they already be doing so and using it as a reason not to cover prenatal, birth, and postnatal procedures since those were easily and freely avoidable medical conditions and are ones even Institute of Medicine supposedly says are critical to control? No. 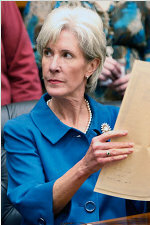 Be outraged at Sebelius’ perfidy, stupidity, and mindless following of the Liberals’ dogma. Don’t be suckered into being outraged over things that, in context, were never said or implied. This entry was posted on Wednesday, March 7th, 2012 at 6:30 pm and is filed under Politics. You can leave a response, or trackback from your own site. I really just need to punch her in the head. As my friend put it tonight at dinner, tampons and pads are a critical need for women. Can we force insurance companies to pay for those too? SO ridiculous, it’s frightening! And a slippery slope so slippery, eels are recoiling in horror! Welcome back. It’s been a while since you’ve last let me know you had stopped in. My thought is to forget the contraceptives, abortificants, and sterilization. There’s no slope, slippery or otherwise. The Obama Regime has already told a private industry that they must give something away for free. That’s not a slope; that’s cliff. The only question is what industry and what product or service will they demand be free next. 2010: Do You Have A Permit?